At Mach 2.2, the supersonic jet could fly between New York City and London in 3 hours and 15 minutes. Richard Branson of Virgin Galactic has just partnered with startup Boom Technology to build a supersonic aircraft, Boom Technology announced. The plane would zip through the skies faster than the Concorde jet or any other commercial aircraft today, Boom Technology said. Aircraft that fly faster than the speed of sound were first developed in the mid-20th century. But regulations and technical challenges halted innovation and expansion of the concept, said Boom Technology, which has headquarters in Denver. 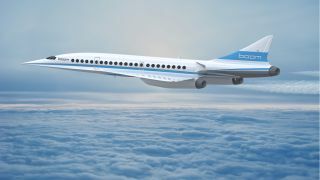 The aviation startup said it aims to change that by developing a modern, supersonic passenger jet that travels at Mach 2.2. That's twice the speed of sound, or 1,451 mph (2,335 km/h). The Concorde, a now-retired supersonic passenger jet, flew at speeds of up to about 1,350 mph (2,180 km/h). At Mach 2.2, passengers could travel between New York City and London in 3 hours and 15 minutes, the company said. The supersonic jet could fly between San Francisco and Tokyo in 5.5 hours, or between Sydney and Los Angeles in 6 hours and 45 minutes. "Building a supersonic airplane is not easy — but it is important," Scholl wrote, describing the startup's motivations. "While we love the hard engineering and technical challenges, what really drives us is the enormous human benefit of faster travel." Commercial air travel's last major speed improvement occurred in the late 1950s and early 1960s, with the introduction of commercial jets, Scholl said. Such jets, he said, made possible the "Hawaii vacation," shortening a 15- to 16 -hour flight to just 5 to 6 hours. Supersonic commercial travel could have a similar impact, making the farthest regions of the planet more accessible, Scholl said. "Imagine traveling across the Atlantic [Ocean], getting business done [in Europe] and being home to tuck your children into bed," Scholl wrote, "or saving two whole days of a typical round-trip itinerary to Asia. … When time is no longer a limit, where will you vacation? Where will you do business?" Boom recently raised $33 million in new funding to develop the startup's first supersonic passenger jet. The company will first build the "Baby Boom," a prototype of the eventual full-size Boom aircraft, Air Transport World (ATW) reported. Baby Boom's first test flight is planned for 2018, Scholl announced at the International Air Transport Association (IATA) Wings of Change conference this week, according to ATW. The full-size Boom, which would carry up to 55 passengers in an all-business-class configuration, is targeted for tests in 2020 and certification from the Federal Aviation Administration by 2023, ATW reported.